North Sulawesi is a relatively unknown treasure as a diving hot spot, but anyone who has ever visited the area before, knows how rich the biodiversity is in these warm, tropical waters. Lazy turtles are hanging out on the corals, schools of colourful reef fish are darting through the shimmering light, and (much) smaller life is waiting to be explored by divers with a sharp eye — from robust ghost pipe fish to teeny-weeny crabs. It’s a sheer joy to dive here and we want divers from all corners of the world to enjoy it, preferably forever. This is why we as a resort take great care of our dive sites. This happens first and foremost through local education: in 2007 we built a school in a nearby village where we train local kids to become dive guides and environmentalists. Arriving guests are encouraged to maintain proper buoyancy, preventing accidental touches or fin kicks. 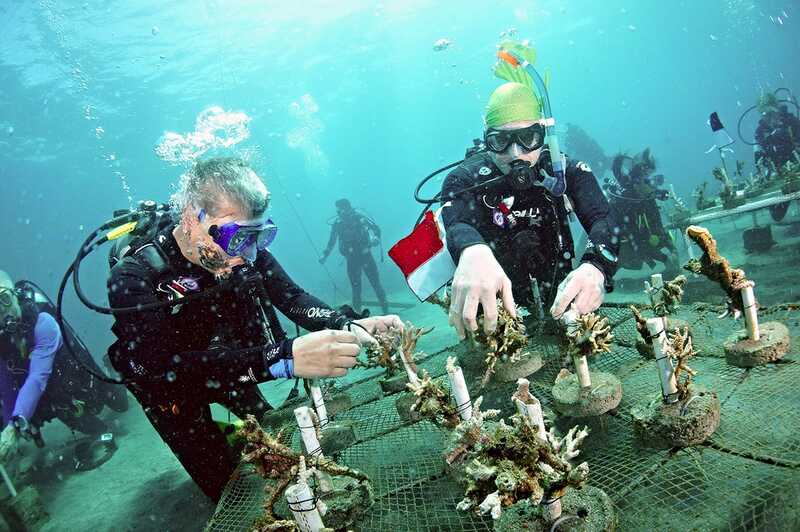 Finally, we organise (or join in) with coral rehabilitation initiatives, and thanks to this, we see quite a few artificial reefs growing nicely in our immediate area. 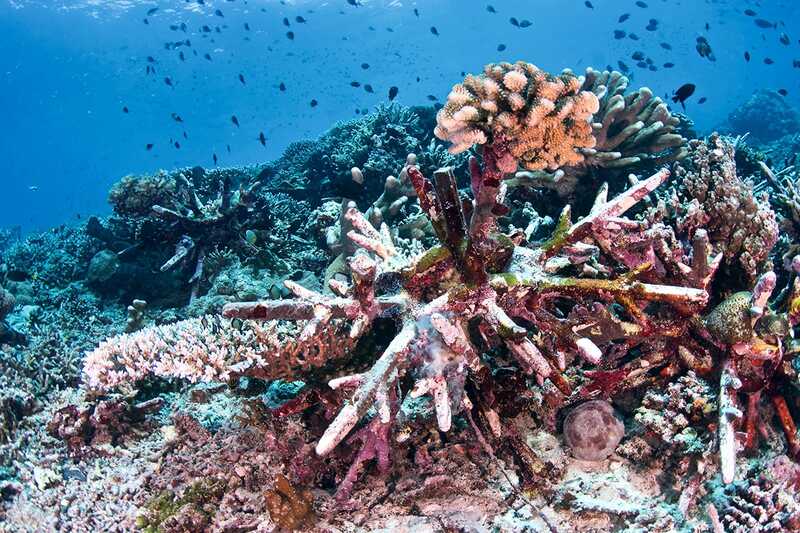 There are many efforts worldwide to rehabilitate coral reefs and many different ways are being tried out. Wood, concrete, iron (with electrical surge), and ceramic are just a few methods to mention. 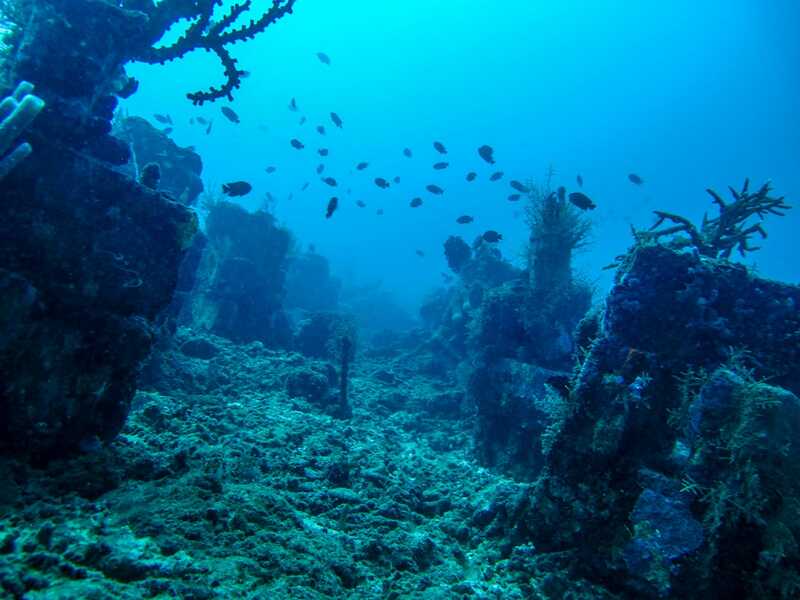 We have listed a few of the efforts in our region; so without further ado, let’s take a look at some of the artificial reef sites that you can dive at here in North Sulawesi. One of North Sulawesi’s biggest success stories of artificially induced coral growth is probably the field near North Sulawesi’s city of Manado. In 2015, over 500 divers attached pieces of coral onto an artificial reef spanning almost 150M2. Recently we took a curious look at the current state there and we are happy to report that this artificial reef is just brimming with life, making the Boboca site definitely worth a visit. With two resorts on both sides of North Sulawesi, each one comes with a uniquely different house reef to explore. At our resort near Manado we have built a number of stacked concrete beams, where brand new coral has settled and which offers an constantly growing number of different underwater species. At Lembeh, the resort’s house reef features an old, overgrown fishing net that is completely encrusted, offering the chance to see all kinds of nudibranchs, Cardinal fish, decorated crabs and a lot of other macro life. 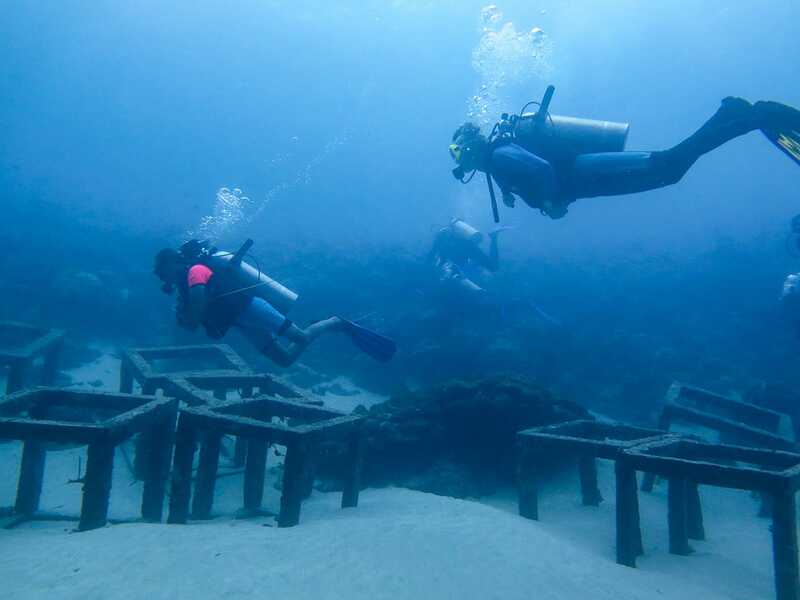 Although technically not an artificial reef in the traditional sense, it is of course a man-made structure, hosting an abundance of hard- and soft corals and sponges. 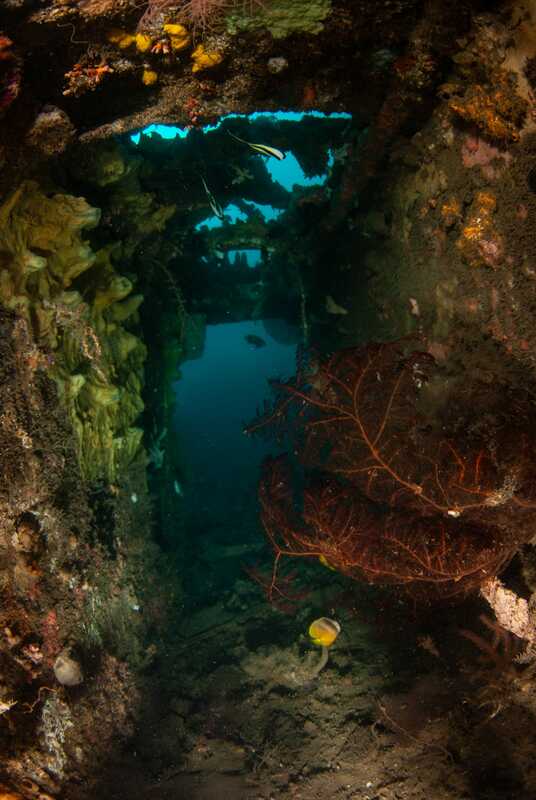 The wreck is a short distance from the resort’s House Reef, with the bow at 25 meters and the stern at 40 meters depth. Meaning “entry way” in Indonesian, Jalan Masuk is popular for a number of man-made features lying on the bottom, its most famous attraction being a statue of two mermaids holding a heart-shaped frame for a (cheesy) photo opportunity. A few meters away from this statue, a deliberately sunken small boat is gaining some welcome overgrowth. A large collection of concrete cubes is arrayed in a wide curve, with coral slowly but surely building up. Some things to find here are leaf fishswaying in the drift, ghost pipe fish and the occasional Harlequin shrimp. Popular for its giant clams and a reef-shark nursery, Fukui Point is having some resurgence of coral life thanks to the placement of artificial star-shaped objects to promote growth on some patches being a bit barren around this fantastically rich dive site. Situated along North Sulawesi’s mainland, Feri Point is only a short boat ride away from Thalassa Manado. Consisting of coral covered slopes and coral pinnacles and is definitely worth checking out. The hollow brick substrates are arranged on an area of about 30 by 30 meters, giving the site an eerie, almost graveyard-like quality. There is plenty of small stuff to find (like tiny nudibranchs or small octopi), but even without a macro lens, the site’s “gothic” undertones makes it an adventurous dive. If you’re the kind of diver who really enjoys being surrounded by natural beauty, artificial reefs might not be the kind of environment that would appeal to you immediately, but once you look past its artificiality, you can discover some fantastic creatures! For those who were starting to lose hope for our seas, they will feel encouraged to help making the necessary changes. I'm a PADI Advanced Open Water diver with a healthy respect for trigger fish. The sight of sharks make me scream like a little girl. I like to tinker with our website, a little bit of IT, and a lot of design work. My favorite Indonesian food is Mie Bakso. My favorite rap artist is MF DOOM and Kenny G makes my skin crawl.